If you wish you could substitute the baby potatoes with some sweet potatoes! Best to use fresh vacuum packed precooked beetroot found in the produce department in SuperValu. If using raw beetroot, wash the beetroot, then wrap in some tin foil with a little drizzle of olive oil and some salt & pepper. Place into the oven and bake for 1-1½ hours until softened. When cooked, allow to cool then remove the outer skin. Cut the beetroot into cubes 2cm and place in a serving bowl, drizzle with some olive oil and lemon juice. Meanwhile boil the potatoes in a pan of salted water then strain and allow to cool slightly, peel and cut the potatoes into quarters and add to the beetroot. Add the orange segments and crumbled Ardsallagh goat's cheese. Check the seasoning, adjust if required and add further lemon juice if required. 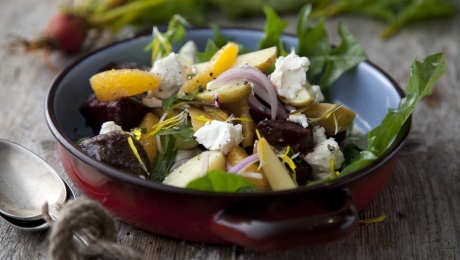 Serve with SuperValu Signature Tastes Herby Aromatic Salad.